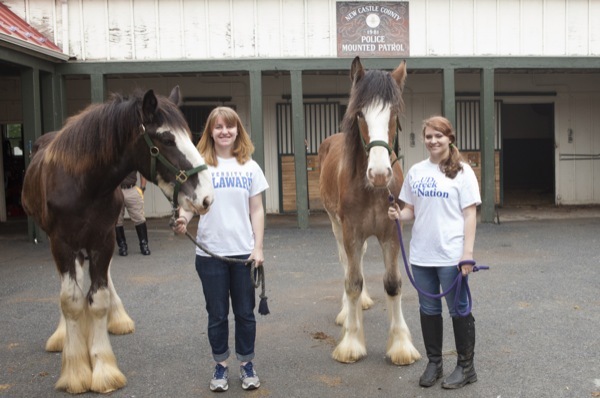 Two University of Delaware undergraduate students, Mallory Marschall and Allison Wagner, have been interning with the New Castle County Police Mounted Patrol at Carousel Park to train two colts — Wrangler and Warden — in preparation for possible service. Unlike most of the other horses in the unit, which were brought in as saddle broke adults, the students had to start at ground zero with Wrangler and Warden, who were brought in at 4 months of age. Marschall, a junior majoring in preveterinary medicine and animal biosciences, explained that they did a lot of different things with the colts in order to get them adjusted to their surroundings. “They’re babies and they’re scared of absolutely everything, from leaves in the wind to shadows on the ground, so it involves a lot of walking around, getting them accustomed to things,” said Marschall. “Another thing that we make sure to do is the grooming, to get them used to being brushed and having their feet picked, because one day they could be police horses — they have to be used to people handling them and to having people all around them.” Wagner, a sophomore majoring in animal and food science with a minor in nutrition, explained that in addition to washing and grooming, they also spent part of their time training the horses on an obstacle course and on a sensory trail, desensitizing them to the variety of sounds, colors and shapes they will experience while out on patrol. The purpose is to get them used to unusual sounds, sights and sudden movements so they will not spook as easily when they are older. Mary Devine, senior sergeant with the mounted unit, said that the obstacles in the obstacle course are set up to teach the colts something different, such as unsteady ground, water, or anything that makes them uncomfortable or takes them out of their element. “For instance, we’ve set up a gigantic, seven-foot-tall multicolored ball because our horses are trained to go forward, no matter what. And that’s what we’re trying to get these guys to do, to not be afraid of something that’s bigger than they are,” said Devine, who explained that the obstacles are important in the development of the colts because the animals could one day be used for crowd control. “The idea of them pushing through an object is something we want them to get used to. Horses are flight animals; everything is the boogie man. They’re prey and if they see something that scares them, they run the other way,” said Devine. “We don’t want that in our horses; we want them to overcome that fear, so what we have the students doing is teaching this at an early age. The training is so that when they’re ready for us to get on their backs and we say ‘go forward,’ they won’t be afraid to do that.” Other obstacles on the course included a group of barrels that the colts were taught to move with their chests; a tarp, which is difficult for horses to walk over because it can wrap up their legs; a wooden bridge; and an orange traffic cone, something used because of its unusual color. On the sensory trail, the colts are exposed to different colored flags that flap in the wind, mailboxes and wind chimes, statues and flowerpots, which the colts have to walk by without trying to eat the flowers. This is key in their training, as the colts are distracted by every little thing that surrounds them, from butterflies to birds, to loud leaf blowers. “These guys have made an incredible amount of progress and that’s something considering they’re babies,” said Marschall. “They’re temperamental and they’re not always going to want to do stuff — they’ve come a long way.” Wagner agreed that it has been great to work with the colts and to track their progress. “I really love working with the colts because I love working with the baby animals. They have a lot of spirit and it’s just really fun to work with them and to see them progress because they’ve gotten so much better since I’ve started,” said Wagner. Another interesting part about the students’ involvement is that neither had much previous experience with horses. Wagner grew up participating in some horse riding camps and then took a break before joining UD’s Equestrian Team last year, where she got the chance to ride again. Marschall also had minimal exposure to horses. “I did a summer camp and that was about all the experience I had, besides the animal science lab that we had with the horses. So they taught me everything from grooming to leading them to how to interact with them properly. It was a lot of work. Not only were they learning but I was learning, too,” she said. Erich Selhorst, an officer with the NCC Mounted Patrol, said it was great to have the students work with the horses. “It’s very beneficial to us because we need to work on desensitizing the new colts but at the same time, we’re police officers and have to go out on the street in some of these communities that need attention,” said Selhorst. “With the students taking the reins of dealing with the colts and doing some of the desensitization work, we can go out and still do our job as mounted officers.” Article by Adam Thomas Photos by Ambre Alexander Payne This article can also be viewed on UDaily.